In Pega 7.2.1, multiple enhancements to the revision management process improve its functionality and usability. The ability for multiple users to edit propositions in the same decision data rule simultaneously. The ability to include all artifacts that are associated with a specific proposition in a change request. You can implement changes to the logic that is associated with propositions faster and more easily by allowing multiple users to work simultaneously on propositions that belong to the same decision data rule. When modifying (adding, editing, or removing) propositions or changing rules that are associated with proposition data such as proposition filters, when rules, strategies, decision tables, decision trees, and so on, you no longer block other users from revising other proposition data that belongs to the same decision data rule. Now, instead of delegating an entire decision data rule to a single user, you can delegate only the selected propositions that belong to a specific decision data rule to different users at the same time. A single proposition can be part of only one open change request at a time. 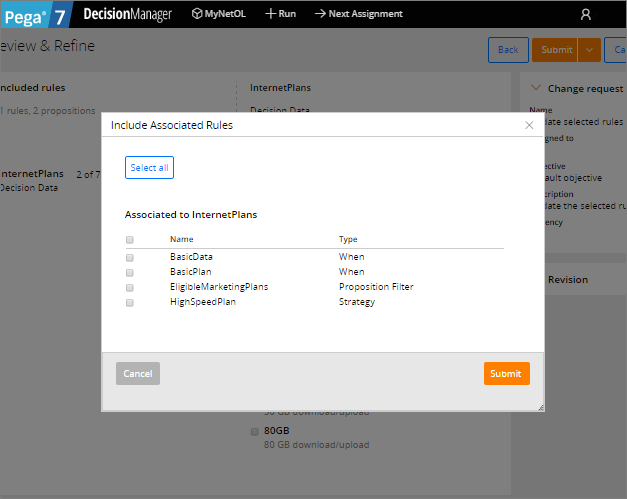 As a revision manager, you can view and dynamically add all proposition-related artifacts when you create a change request in Decision Strategy Manager. 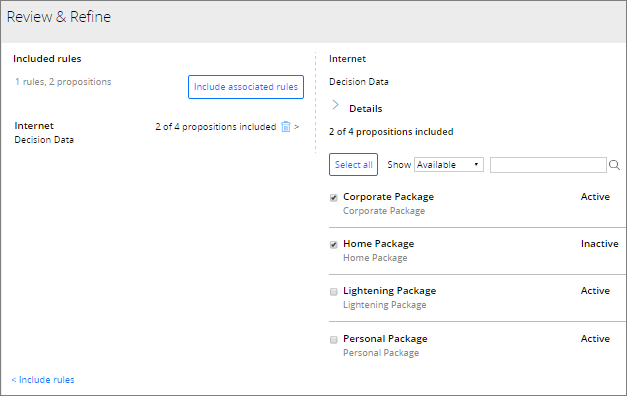 The artifacts related to proposition data that you can include in change requests are proposition filter, strategy, and when rules that are part of the application overlay. The association of proposition filter rules that refer to the decision data is determined by the Group name property. All strategy and when rules referenced by proposition filter rules that are associated with decision data are also associated. This solution improves the user experience and simplifies the proposition logic refinement tasks by creating an easily accessible single point of entry for revising propositions together with all related rules.